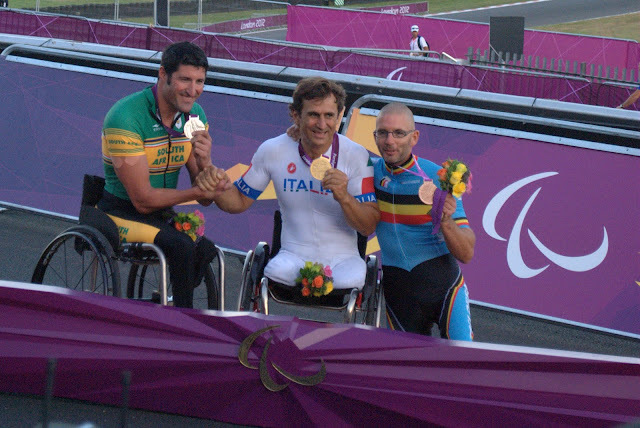 A warm congratulations to Alex Zanardi on his three medals, two Gold and one Silver, achieved last week in the handcycling at the London 2012 Paralympic Games. It has been a very long journey since losing his legs at the 2001 American Memorial 500 at the EuroSpeedway Lausitz in Germany, just days after the attacks of September 11th. The man who according to NASA studies ought to have died with that amount of blood loss, through the skills of the CART medical team headed by Drs. Terry Trammel and Steve Olvey and also the German hospital staff, was able to make a remarkable recovery. Indeed just three months later Alex was at an Italian awards show where he stood again in public for the first time. Three months! The largely American and Canadian CART paddock was already downhearted and didn’t really want to be in Europe, his accident only served to excacerbate the feelings. Somehow, because they are racing people and that’s what racing people seem able to do, they pulled through and ran the Rockingham race the next week (despite all the track problems there). Via a short comeback to finish that race in Germany two years later, and a fairly successful career in touring cars with BMW (including WTCC race wins and an Italian national championship), he turned his hands to handcycling. He decided handcycle technology wasn’t good enough so, much like his prosthetic legs, he set about designing and modifying his own. He won the New York Marathon among many others. The goal: To win at the London 2012 Paralympics. And now he has achieved it. Gold in the time trial. Gold in the 64km road race. Silver as a member of the team relay. Last Friday I was lucky enough to have a ticket to watch Alex compete in the road race, and all of the great competitors in all six races held that day. This followed an evening at the stadium on that day, Thursday, the night GBR won many medals in the track and field competition which pumped up the 80,000-strong sellout crowd (as if they needed pumping up). By Friday evening it was tough to know which experience made the bigger impression. Brands Hatch held far less than 10% of the crowd the previous night yet the atmosphere during the Zanardi race was as good, the mix of motorsport fans, people who had discovered him thanks to Channel 4 kindly highlighting him so frequently (remember the UK general public who are not die-hard motorsport fans had little idea who he was), and also the supporters of the other athletes who were battling for the podium: Swiss, Austrian, Belgian, Irish, and yes, Italian. To be so close to Alex not only as he raced but also after Lou and I had managed to put ourselves where the victory podium was set up, to be no more than 10 metres from the man as his gold medal was draped around his neck and he sang his national anthem along with many in that crowd, it was a privelige to see a man achieve his dream. What now? After the win he told interviewers he might feel a gap in his life now that he has achevied the goal of Paralympic Gold that he’d been working towards for so long. How to follow it? He jokingly said the next step is to add another wheel and an engine, but this is Alex Zanardi.. was it a joke? Jimmy Vasser and Chip Ganassi are allegedly working on car for the Indy 500. Another joke.. or serious? In a way I hope he does. In another way I hope he doesn’t because to my mind he has nothing left to prove. Finally, another fan at the event recorded a video of the day. It really does capture it perfectly – the video is just like being there. You might even get as sick of the Dolly Parton clips as we were – they played it every time the field came by the start line which was a lot with two races running at the same time! This guy does shout a bit much, though Alex doesn’t seem to mind. 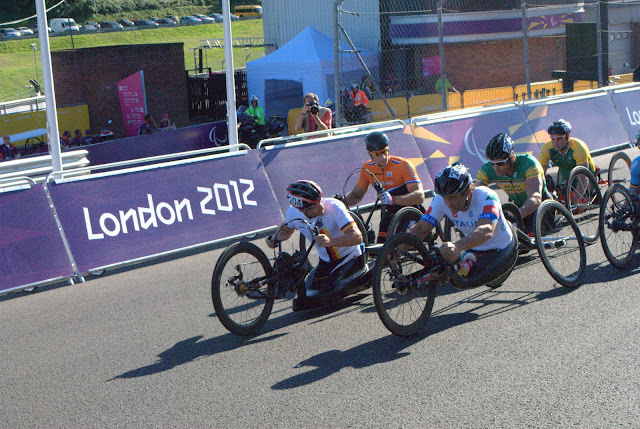 For more photos of Zanardi and the other cyclists at Brands Hatch across the six races that day, as well those from my Thursday in London at the Paralympics, take a loko at my photoset on Picasa here. I also went up to London in July during the Olympics although not to many events, but if you want to see the city in the grips of Olympic spirit (and you should) then that set is here. I know I’ve been going about it on Twitter but I don’t care, it was such a great summer I want to share it with everyone who couldn’t be here!